One of the more intriguing vegetables from my CSA pick-up was dino kale. I had previously made kale chips from curly kale, but I wanted to try something different with this reptilian variety. 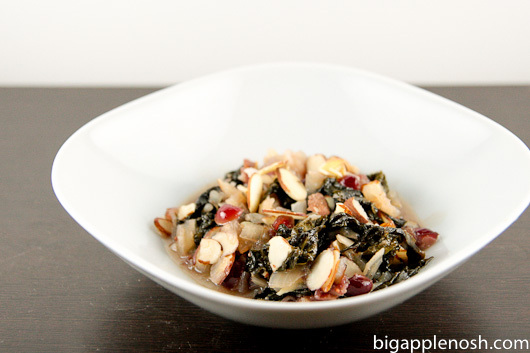 I found this recipe for sweet and savory kale particularly appealing for its cranberries and sliced almonds – the result? True to name, sweet and savory (duh!). Kale fan? Yay or nay? I reaaalllyyy want to like Kale, so I will try this one (sans cranberries, substitute Splenda for sugar). How did you like it? I liked it, but if you’re ambivalent about kale, I think I like kale chips even better! I haven’t tried kale yet. It looks so healthy! Fine. I’ll try it. HUGE kale fan! I would definitely try this recipe if I weren’t allergic to almonds. 😉 I wonder if it’d be good with cashews? Probably! I’d be interested to hear what you think of it with cashews! how funny–i am eating farro with kale as i read this! this recipe sounds yummy, i will have to try it! the kale look so rich and your finished dish always looks good 🙂 i’m not that big a fan of kale, but am open to trying it as different meals. 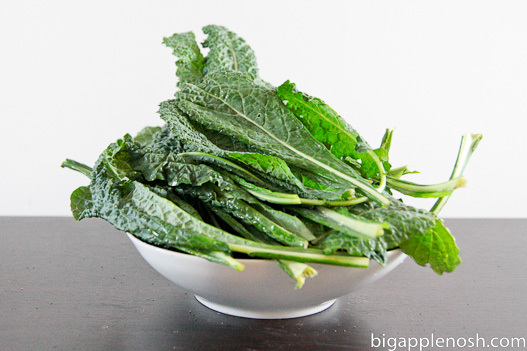 Kale is one of my favorite bitter greens: It’s so delicious and versatile. This is a really interesting spin on it — the cranberries are a really nice sweet touch. I just picked up Dino kale at the farmers market on Monday and made some kale and cannelloni bean soup with it, but this looks a lot more interesting.